INTRO 24 y.o and fed up with 9 to 5. Looking for fastlane. Discussion in 'Forum Introductions (Who are you!?)' started by Smuggo, Apr 15, 2018. My name is Tom. I wanted to say hello and share some of my thoughts. I have been working 9 to 5 for two years. Before that I didn't work much, only from time to time. I was kinda addicted to computer games because in real life I was a... life loser. My family was forcing me to get the job snce I was 19 but I did my best to avoid it, so I went on studies which cost me 3 years of my life and gave nothing in return. Only more 'Get the real job right now!'. After 6-7 months of my job I read the Richard Branson's book 'Screw it. Let's do it' and I was like 'Woah I want to live like that guy' but nothing has changed in my life. I was thinking about some business ideas but nothing came up to my mind so I moved on with my super career (but still trying to figure out something). Like 6 months ago I found the book one of the gurus with Millionare Mind. Since I've read it I am thinking about business everyday but still nothing!! Was trying to change my mindset, read more books but after half a year I am still in the same spot. I've joined to the guru seminar(paid of course) about personal development. One of them told me about The Millionaire Fastlane book. I bought it 5 days ago and almost finished. This is how I end up here. To be honest I got the feeling that the Millionaire Fastlane is not for me. Maybe that's the wrong mindset but it's hard to change it since I had belives problems for a long time. 6 months (even more) of thinking about buisness and nothing? That's not a good prediciton. 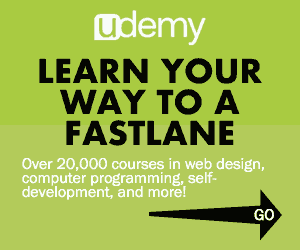 The desire in me to being on the fastlane is burning inside me. I don't want to spend my 40 years without feeling that I acutally live. Yea, that exchange 5 to 2. There must be a way for me to get out of that. All other people are accepting it, I am not. That's what I want to belive but sometimes I got the thought that it's only a way for smart, enterprising person and I am not one of them. I've never felt innovative. But here I am, on this forum, looking for answers with a spark of faith that I am going to be rich and free before I hit 30s. To be more specific I don't want money just to be rich, but for the tons of things I can do with them. Thanks for the books M. J. DeMarco and other things you're doing. I am sure it has changed live for many people and I hope to be one of them and I will be able to thank you personally in nearest future. P.S. Sorry for my English. I am not native speaker but I did my best. ericaung, Silver Silk, Kennypaul and 6 others like this. Hi there Tom! Doubt is normal and everyone goes through it. Will you conquer it? Be patient and realize the mountain you're looking at right now is climbed one step at a time. Good luck. Smuggo, ZF Lee, Ocelot and 1 other person like this. 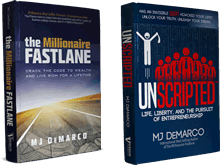 After you finish The Millionaire Fastlane, read 'Unscripted', also by MJ. This book gave me a big kick in the pants (Did not finish because I'm treating it like a textbook). The biggest question is what value can you provide this world? aka what relatively large need can you solve? Silver Silk and Smuggo like this. Hi Tom it's great to have you here. Don't worry too much about thinking up some great business idea. You'll put too much pressure on yourself and get discouraged. Do you have a skill which you can monetise online? I think at your stage the best thing to do would be to try and learn a valuable in demand skill and then you can use that to generate income. Once you've got your income level up it's much easy to start a business as you have more free capital to invest. This is a philosophy that Dan Lok preaches. He got good at selling his copywriting service to the point he was making $10k a month. That leaves a lot of spare money to invest in your business ideas. The idea doesn't need to be too unique either to be successful, you can offer a service other businesses are already offering but do a better job. Once you make it to the right hand side of this Illustration ( Business Owner and Investor) you're making that Fastlane Money and aren't trading time for money. But I think to get to that position it takes an initial skill upgrade and grind. The best thing you can do for yourself right now is learn how to sell to people. If you can sell you can make money, whether that's a product or service you provide. This forum contains an absolute wealth of information on skills you can use to make money and sales techniques. Spend a few days reading Gold posts and making notes. Then pick a skill you think you can do, learn it and then grind sales. Maybe this isn't the advice you wanted to hear, but I honestly believe that if you commit to it you will significantly improve your situation in the next 6 months. You spent the last 6 months trying to think up a business idea. It's time to get out of your head and put something to work. Spend the next 6 months taking action. Storm24, Bulio, MJ DeMarco and 3 others like this. Can I start with the title.... Fed up with 9-5... Fastlane starts with a mindset. That mindset is not fed up with any type of work. Smuggo and MJ DeMarco like this. Welcome aboard my friend. You write great for having English as a 2nd language, don't worry about. Thank you for replies. What I meant by title is that I am fed up with exchaning my life for money. 5 days to 2. Living just from weekend to weekend. Living on the left side of quadrant and being aware that there is a right side. Doing the job i don't like for the rest of my life when there are other ways. But yea.. I don't like my job anymore. It's taking my life to nowhere but being a slave for 40 more years. Being fed up with 9-7 is really a wrong mindset? I don't like that system. Or maybe I've used a wrong word for it but if not looks like I am in the dead end and won't get too much from my life. Hey Smuggo.Doubt is normal.We all have to fight through it from time to time.It's good to have you here.Welcome to the forum!. Smuggo and Silver Silk like this.